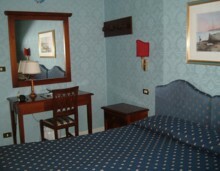 A lovely four-star hotel in the historic centre of Rome; ideal for romantics who want to wander home at night. 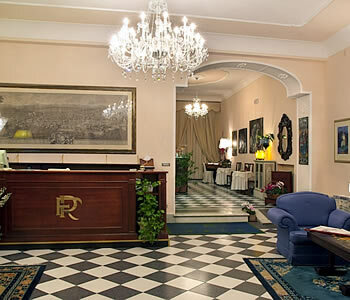 I booked two nights at Residenza in Farnese in May 2005, subsequently returning for a third night. I found a better deal through booking online (through the links on this site) than I was quoted at the hotel. The hotel, which is fairly new, is in a historic building which was once a religious foundation. As well as thirty-one bedrooms the hotel also has good-sized public areas where they can organise meetings and receptions. There is a pool table and a small bar. The neighbourhood is lovely; the reception is attractive and smart; the receptionist friendly and welcoming; and when I reach my room it gets even better. Despite booking for a single room, I have been allocated a double (single travellers note: this seems to happen fairly frequently in Italy), and what a room! The furnishings and fittings are good, but what grabs my attention straight away is the large window. Having opened the shutters, I lean out to enjoy a wonderful Roman view. I can see the narrow lane below, the walled gardens and terraces of the Palazzo Farnese opposite, the fountain at the end of the street, a corner of the piazza, a marble church facade and even a glimpse of the River Tiber. As a light sleeper, I discover two negative points on my first night. The historic street below my window may be fairly quiet, but when tourists stand outside talking loudly, the noise echoes up to my fourth-floor window. And the mini-bar - which I have no intention of using - irritates me with its hum and sudden changes in running noise, even waking me once as it makes a sudden stutter. In the morning, though, the excellence of the hotel strikes me anew as I arrive in the lavishly-appointed breakfast room, and take my seat by a tinkling fountain. The buffet breakfast is one of the best I've encountered in Italy and Residenza in Farnese actually offers a cooked breakfast to its guests - ok, so you have to pay extra for your eggs and bacon, but it's still going a lot further than its fellow hotels. The buffet is large, with good choices of cereals, cold meats, cheeses and pastries, along with yoghurt, fruit salad, fresh fruit, warm croissants, bread, fruit juices and hot drinks. It's all good stuff and after a number of return visits to the buffet I leave breakfast feeling almost too full for sightseeing. For absorbing the atmosphere of the Centre Storico, Rome's historic centre, this location is absolutely ideal. The hotel is on a small pretty lane just off the elegant Piazza Farnese. Just the other side of this square is the busy Campo de' Fiori, fruit and veg market by day and youthful hang-out at night. It's only a short walk to Piazza Navona or over the river into Trastevere. For seeing the medieval streets and the more central attractions, you will be able to wander on foot and feel part of the city. It's not such a good location for public transport, but then you probably won't need it much staying here. It's certainly many times more romantic and pleasant to wander back here after a leisurely dinner than to board a crowded bus for the railway station area, where most hotels can be found. You pay more for the privilege of staying in this area, but if you can afford it, it's well worth the extra cost. The hotel is comfortable and staff are extremely helpful. Request a room with a nice outlook - when I returned a second time I had an inferior room with little natural light and a view over a scruffy interior light-well. There could be one or two more touches to make guests more comfortable - spare blankets, quieter minibars, better soundproofing - but on the whole you will be more comfortable here than at most hotels of its grading in Rome, and in a much better area. Address: Via del Mascherone 59. The most comfortable way to arrive is by taxi (which should cost €10 or less from Termini), since otherwise you'll find yourself dragging your suitcase over the uneven old paving stones of the historic centre. The nearest bus route is the 116, a little electric bus which passes the Metro at Barberini and meanders through the centre to Piazza Farnese. There's a limit to the amount of luggage you can take on these vehicles though. Otherwise the nearest bus stops are on Corso Vittorio Emanuele, used by many of the city centre services, including the 64 and the 40 Termini - Vatican routes. 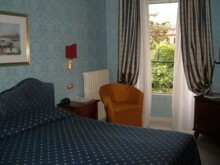 Residenza in Farnese hotel review by Italy Heaven editors.